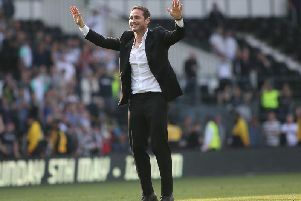 It was a case of apprentice beats master at Old Trafford on Tuesday night in the Carabao Cup as a Frank Lampard inspired Derby County advanced into the next round of the competition after a penalty shootout win over Jose Mourinho’s Manchester United. Lampard’s hungry Rams came from a goal down to lead 2-1 on the night before the Red Devils scored a late equaliser to take the third round tie to penalties, where the visitors held their nerve to win 8-7 after Phil Jones saw his spot kick saved by Scott Carson. Juan Mata had put Mourinho’s men in front before Derby’s Liverpool loanee Harry Wilson equalised with a spectacular free-kick. Rams’ summer signing Jack Marriott showed a glimpse of his predatory insticts to put Derby ahead, only for Marouane Fellaini to level matters late on to take it to penalties.